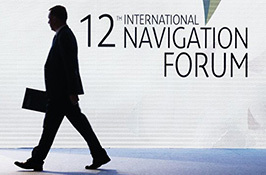 The 12th International Navigation Forum has completed its work in Moscow. The key event of year in the field of commercial use of satellite navigation technologies and, particularly the Russian navigation system GLONASS, has brought together 1,200 delegates from 400 companies – representatives of the transport telematics and satellite navigation industry from all over the world. At the event they identified new technology directions, innovative developments, ways of research competency enhancement and expert status of leading enterprises of the navigation market. Autonet 2.0, industry digital transformation, smart city development and intelligent transport systems, connected mobility, digital platforms and BigData, ERA-GLONASS, navigation solutions for IoT (Internet of Things), drone and unmanned system application, insurance telematics, geo-information systems, geodesy and cartography, high-accuracy positioning, protected mobility, cybersecurity and blockchain – these and many other topics were actively discussed by industry professionals at the plenary discussions, round-tables and sessions. Addressing the Forum’s participants, the Minister of Transport of the Russian Federation, Maxim Sokolov, noted that the use of navigation technologies today was an important condition for ensuring transport safety and improving the whole transport system performance. “We started new evolutionary changes of many types of transport, primarily related to appearance of unmanned vehicles. “We are expecting the new milestone of transport modernization that can be only compared to the mass motorization and passenger aviation introduction”, Maxim Sokolov says. The GLONASS development, competitiveness and the use of navigation technologies based on it are one of the Russia’s policy priorities. The use of navigation technologies based on domestic navigation systems in almost all industries of our country is a driving force for their innovative development. "The implementation of projects using GLONASS-based navigation technologies, such as ERA-GLONASS accident emergency response system, Platon system, transport and dangerous goods transportation monitoring, high-accuracy positioning, allow saving human lives, creating qualitatively new business models, logistics, increasing the flow of payments to the budget, ensuring the reliability of facilities, strengthening environmental safety and improving the efficiency of Russian economy sectors. The GLONASS system has also proved its effectiveness in the anti-terrorist operation in Syria”, CEO of ROSCOSMOS Igor Komarov noted in his welcome speech. “The main event of Russian navigation and transport telematics industry, the 12th International Navigation Forum 2018 has completed its work. This year it brought together top executives of large companies, experts and representatives not only of the navigation industry, but also of transport, auto-making, telematics and IT industries. The special interest was generated by development trends of technologies for transport with a high level of automation, one of the main Autonet market growth drivers,” President of NP “GLONASS”, Co-head of Autonet NTI Working Group, Member of the Presidential Council for Economic Modernization and Innovative Development, Alexander Gurko, emphasized. He noted that the forum had debated the development of satellite navigation systems, new business models, navigation and digital technologies in logistics of people and things, summed up the industry’s results. On the sidelines of the forum there were many meeting with partners, market players, analysts and experts. “Particular emphasis was laid on regulations on Autonet markets during the round-table, which was attended by representatives of projects implemented on the market of transport logistics services, intelligent mobility, telematics and information systems. The agreements and arrangements reached will be shortly implemented. I thank all participants of the forum for their interest and high collaboration results!” Alexander Gurko added. The transformation of road transport and the development of new directions are mostly linked to such factors as the increasing of safety, ecology requirements, as well as the provision of new opportunities though connecting vehicles to the Internet. The development directions in the automotive industry became connected, autonomous and electro cars. By the end of 2020 on roads of Russia there will over 14 million connected vehicles, among which 3.5 million trucks and over 10 million personal cars. According to navigation industry experts, the Russian economy digitization is having a significant influence on the industry’s development. The experts devoted considerable time to this topic in their speeches, pointing out that the forum had the status as one of the main scientific and information platforms and could be seen as one of the elements for implementing the national strategy in this direction. “Global trends of the transport industry digitalization are embodied in the Russian Federation. This is particularly evident in the field of navigation technologies, in Smart Cities and sharing economy. Highlighting the trends at the annual forum allows participants to better understand development directions of the market,” Sergei Khanenkov, Project Manager of PJSC Rostelecom, says. Intelligent transport systems are one of the priority markets for the industry’s development, including the National Technology Initiative (NTI). “At a recent meeting the Council for Economic Modernization and Innovative Development the Autonet ‘Road Map’ was updated. Now it is focused not only on unmanned transport but also on the development of transport logistics services, telematics information systems, intelligent city mobility. The Navitech Exhibition allowed demonstrating new Russian developments and NTI projects in this field,” CEO of the Russian Venture Company (RVC), Akexander Povalko, stated. At the Exhibition “Navitech-2018”, which was held jointly with the forum, RVC and NP “GLONASS” presented high-technology projects at an Autonet booth. They included a RoboCV unmanned bobcat for an effective work of warehouses, “Samokat Sharing” platform for micro transport of the Last Mile, “Parkomatika” parking automation system, “Agroroboservice” unmanned agricultural machines, a connected from Smart Driving Labs and an electric vehicle charging station from Electro City. This year, for the first time, the Navigation Forum is combined with the conference “Smart Insurance”, which took place on April 25. Such a move was driven by the intersection of topics raised at both events, as well as the opportunity to bring together on one platform all representatives of relevant industries, who are united by a need in discussing industry issues and search for technology solutions though GNSS. Such solutions are used in industry, agriculture and transport, in particular, for transport services on new business models, insurance telematics, unmanned vehicles. The conference “Smart Insurance” has bought together insurers and telematics platform developers. The Navigation Forum participants, whose activities are related to digital developments, monitoring solutions, navigation and telematics solutions, received the opportunity to attend the conference and to present their developments.